The Charpy Specimen Machine uses a 5 bladed cutter with easily replaceable inserts, used without any cutting lubricants. Up to 4 specimens can be machined at the same time and these are mounted in a rotating fixture. After the first rotation, which cuts the first side, the fixture is removed and turned through 180 degrees to cut the second side, after which the specimens are remounted in the fixture at 90 degrees to cut the third and fourth sides in a similar fashion. On completion of the fourth side, a 10mm square specimen is achieved, meeting surface finish and dimensional tolerances of all international standards including ASTM and BSI. The Charpy Specimen Machine In its basic form, has a single cutting speed appropriate to user applications. If a wide range of steel is being tested, then the machine can be offered with a variable speed thyristor controlled D.C. drive. The rotating fixture drive on all machines has a variable speed adjustment by thyristor controlled D.C. drive, giving a selectable feed rate. These facilities enable optimum conditions of surface finish and tool life to be achieved at all times. An easily followed setting guides included with the machine.In production the machine will produce complete specimens at the rate of 4 every 8 minutes and is capable of cutting steels up to a hardness of 42 Rockwell C.
The Charpy Notch Broaching Machine will cut Charpy V and U notches and Izod V notches in 10mm square alloy steel specimens up to a hardness of 42 Rockwell C.
Intended for bench mounting, the charpy notch robustly constructed broaching machine cuts the notches by means of a specially designed Multi-Toothed Broach which is drawn across the specimen by rotating the spoked handwheel. A simple Hand Vice for holding the specimen is built onto the machine body and the tooling includes the adjusters and end stops necessary to ensure notch depth and position are correctly set. 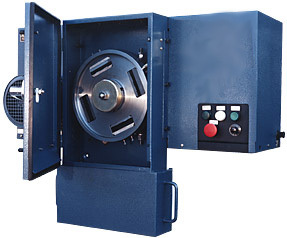 This Motorized Charpy and Izod Notch cutting machine will cut Charpy V and U notches and Izod V notches in 1Omm square alloy steel specimens up to a hardness of 42 Rockwell C. It is a free standing unit of simple, robust construction requiring only a single phase electrical supply for its operation. The cutting of notches is achieved by means of a specially designed Multi-Toothed Broach which is drawn across the specimen at the touch of a button. A simple Hand Vice for holding the specimen is built onto the machine top-plate and is complete with the adjusters and end stops necessary to ensure that notch depth and position are correctly set. Attachments are available to facilitate Izod single V notching in 0.45" dia. specimens and Izod multiple V notching in both 10mm square and 0.45" dia. specimens. Broaches are not included in the quoted price and these must be ordered separately from the range available. An operational floor-to-floor time of 17 secs. can comfortably achieved and maintained. 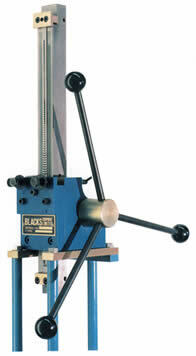 Charpy Notch Broaching Machine, designed to correctly cut V or U notches in Charpy-Izod test specimens. Fast, accurate and reliable: Clamp your 10mm square Charpy or Izod test specimen in the adjustable base jaw, push the reverse starter button and wait just 10 seconds as a 17" long broaching tool with its 57 cutting teeth eases through your specimen. The final four teeth provide precision material removal of .0001" each to ensure optimum surface finish and dimensions of the notch as specified by ASTM standard designation E-23. The broach itself is drawn by a twin lead screw mechanism geared together and driven by a ¼ hp motor mounted in the unit. Controls consist only of a reverse starter switch for the cut and return stroke of the broach. Limit switches within the machine shut off the motor at the completion of each stroke. This floor standing model gives a comfortable working height at the base jaw clamp. The Vari Speed machine is made available to satisfy demand for broaching notches in material up to RC60. The slower cutting speed is also desirable to extend the life of the broaching tools between sharpenings when cutting these harder materials.